Scandinaval is a solid professional in demanding infrastructure construction and project management. Starting from 2010 Scandinaval has been operating in the Olkiluoto 3 Nuclear Power Plant construction site in Finland. The training center in Kiev is now open! Scandinaval participated with "Team Finland” and the Foreign Trade and Development Minister Ms. Lenita Toivakka at the Nordic Construction Summit, where as part of the summit there was introduction tour in the expansion site of Gardemåen Airport. 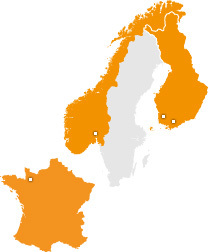 Established in 2008, the Scandinaval Group operates within the Energy and Civil Construction Sectors. We provide scalable manpower solutions to major projects around the world. We have a wide range of professionals working within our teams. In addition our field of know-how extends to demanding welding and metal structure assembly works as well as industrial painting. Our strength is a straightforward and customer-oriented way of doing things.